You can’t predict garbage, and occasionally I still happen upon a pile that forces me to explore a whole new world of junk. 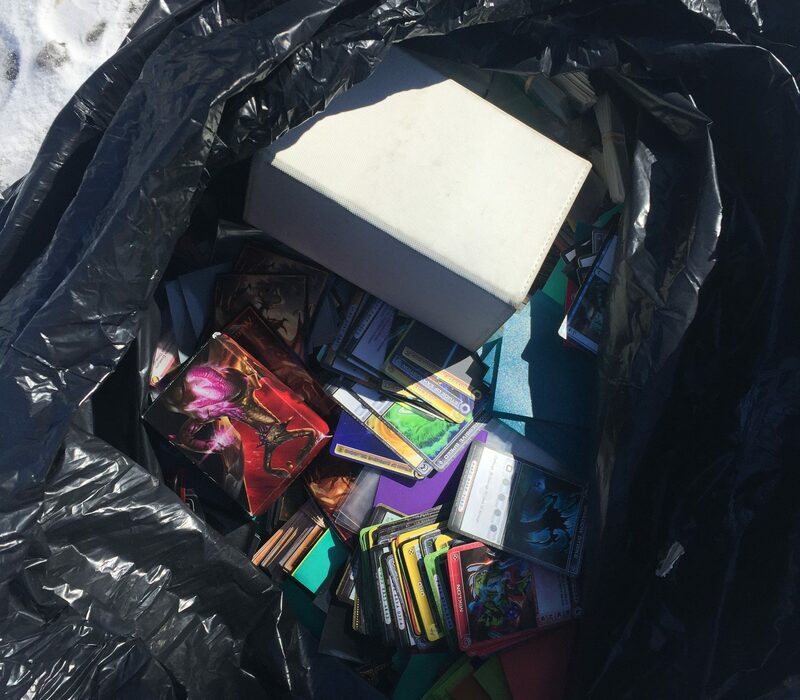 In this case, it was trading card games. These folks tossed bags upon bags stuffed full of trading cards, including Pokemon, Magic, Yu-Gi Oh, Cardfight Vanguard, and a few others. 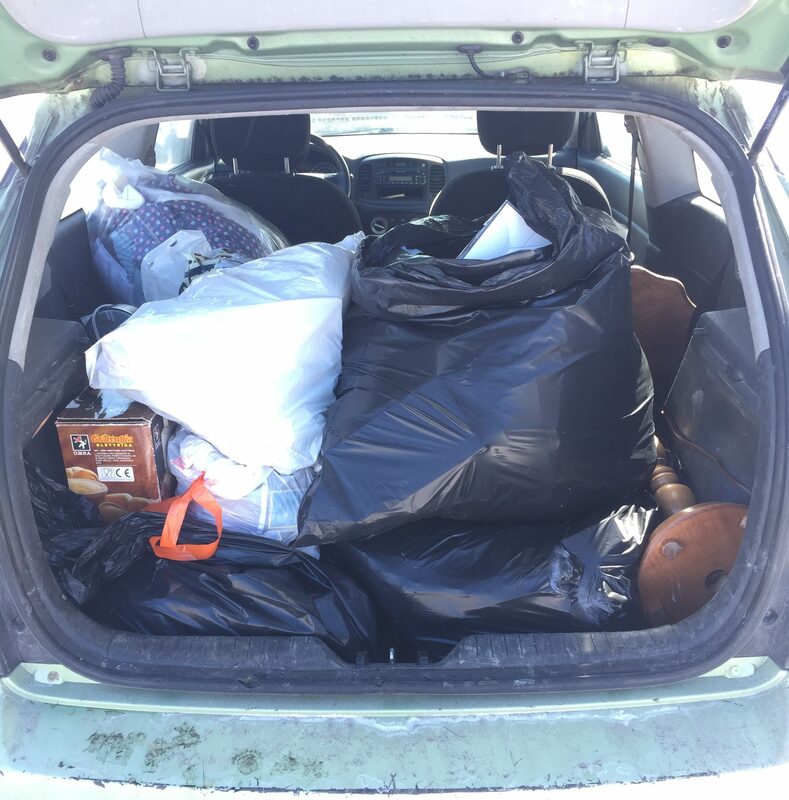 Here’s my trunk largely filled with them! The number of cards I found is pretty incredible. My best guess currently is that there are somewhere between 30-50 thousand in total. 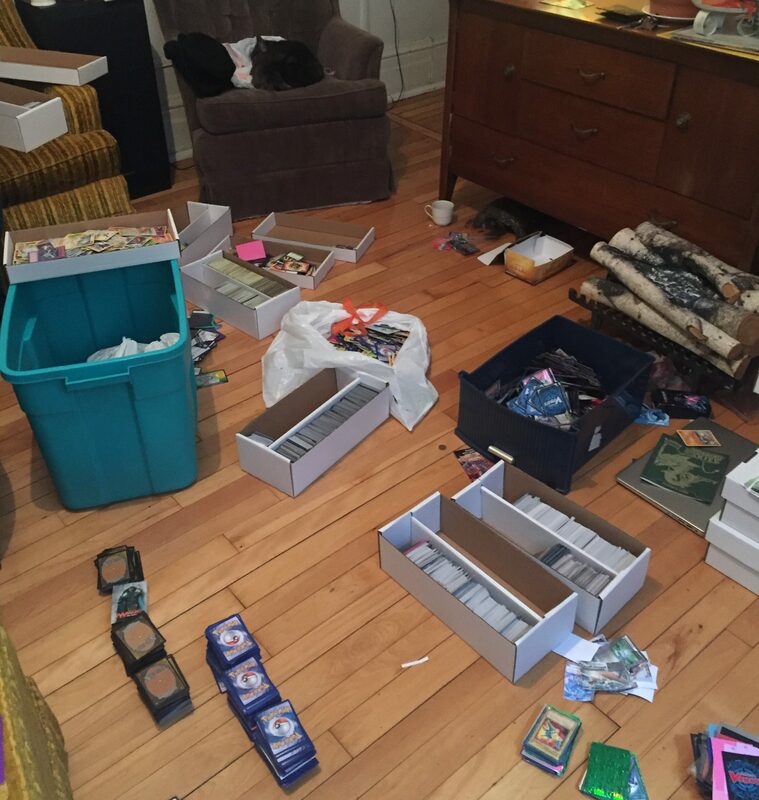 I recently emptied the bags into boxes to make them easier to stack, and based on the weight of one box I’d say that I have about 150 pounds of cards. That’s basically me, but in card form. I knew nothing about these kinds of card games. So, I did some research and now I can say that I know very little about them (a slight improvement). I know that some cards can be super valuable, but most aren’t worth much unless sold by the pound or thousand. I know holographic cards tend to be more powerful / valuable than regular looking cards. Thankfully my sister and her boyfriend have some familiarity with Magic, and while they’re not experts either they definitely know more than I do. For my birthday (on the 30th!) I told them that the best possible gift was to come and help me organize this giant mass of cards. Here’s a scene from that day. The different card sets were all mixed together in the bags, so I figured step one was to reorganize them into boxes I bought from the game shop. The three of us spent about four hours doing this, and we got through maybe 20% of the collection. 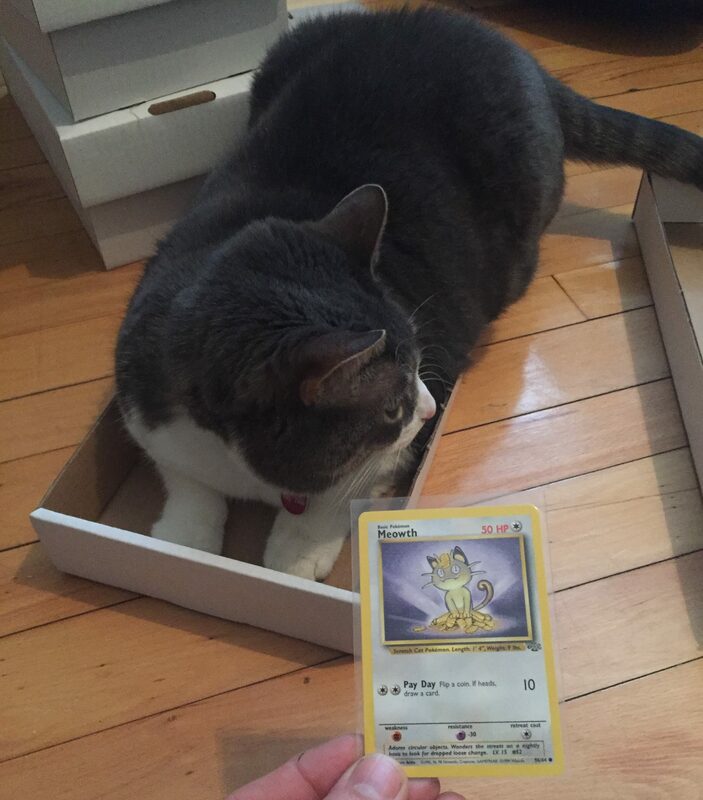 We separated the holographic Pokemon cards when we saw them, and I found an app for my phone that scanned the cards and showed their value on the marketplace. Most weren’t worth much, but I did find some cards in the 1-5$ range, a couple of 10$ cards, and one (an “Ex”) that was worth 30$. I’m glad I found that 30$ one, if only because it shows that the collection wasn’t totally picked over before it went to the curb. A lot of the people I’ve talked to have wondered why they were thrown out. It’s a good question, one that is important to consider when thinking about how much time and effort to put into researching them. 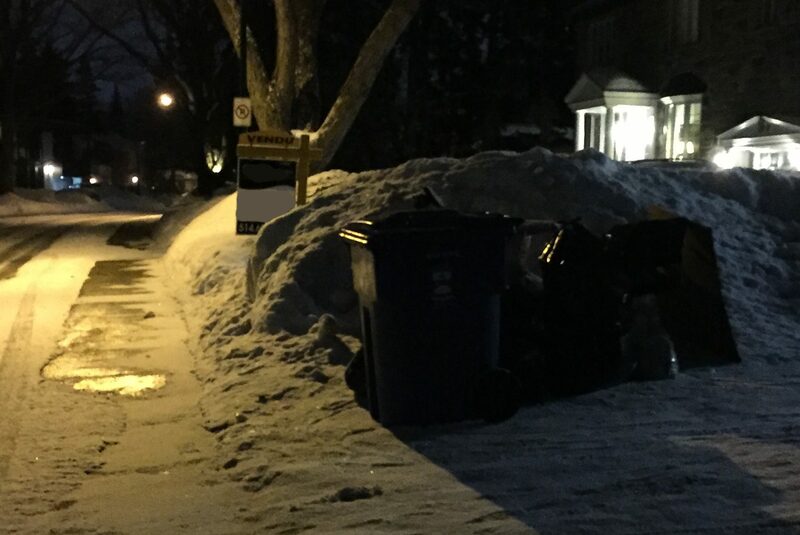 The best case scenario for me is that they belonged to rich kids (this was a nice part of town) who moved away from home for university, and when their parents were getting ready to move (the house had been sold) they decided to ditch the dead weight without consulting the kids. The worst case scenario is that whoever owned them picked out the best cards, and tossed the rest. The 30$ card doesn’t make the worst case scenario impossible, but it does indicate that their tossing might not have been a super organized affair. Anyways, I’ll keep you posted as I learn more about their cards. They’re a good find regardless – I’d guess that, sold in bulk they’d make me a few hundred bucks at the auction house. But I’ll do my due diligence before I take the easy way out! The dregs from that spot came a couple weeks later. There were just a couple trash cans out, inside of which was random junk which I’d guess was left behind after the move. 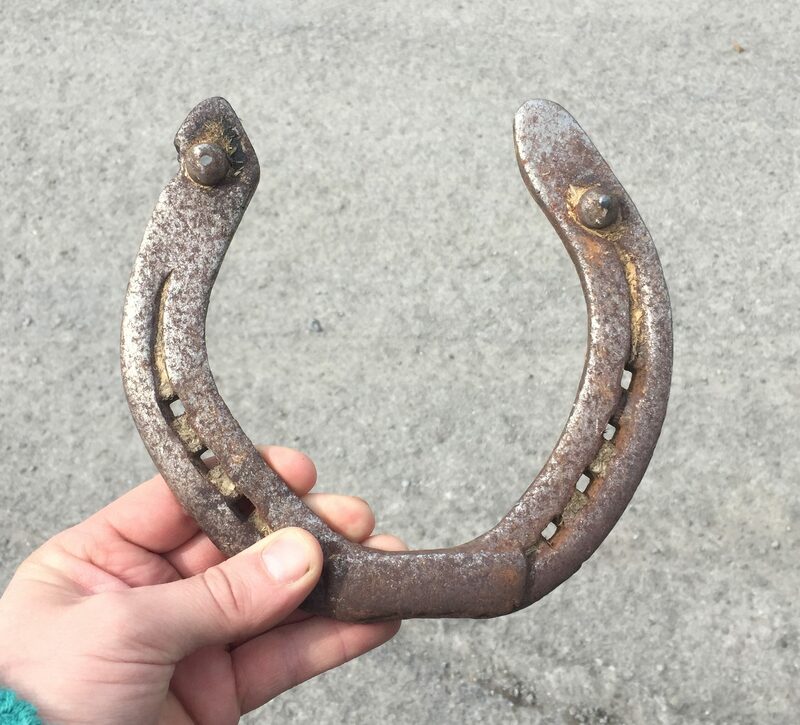 I spotted something old and metallic at the bottom of one of the bins, and that object turned out to be this old horseshoe. Hopefully it bodes well for the card collection! Regardless, my luck immediately after finding this horseshoe was quite good. I found some top quality (ie: “best of 2019” worthy) junk that night, which I’ll share here soon enough. I also happened upon a great spot purely by chance later in the week. I’ll share those finds soon enough. In the meantime, here’s some miscellaneous finds from recent weeks. This is an old chair I picked up in Ville St Laurent. I thought the woodwork was pretty good, and the upholstery in decent shape for its age. 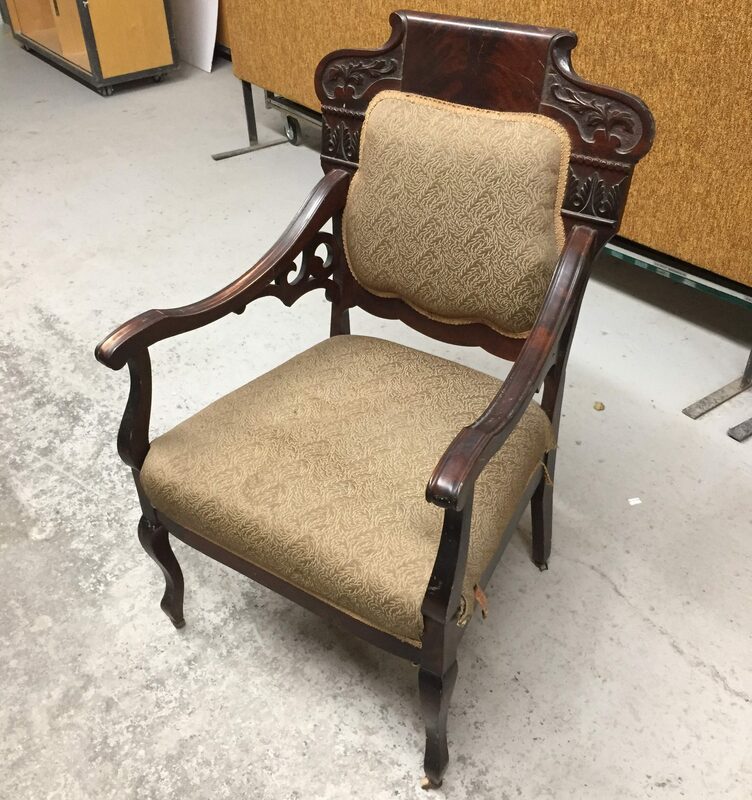 Mid century and industrial is where the money’s at these days, but this chair still sold for 40-some dollars at auction. 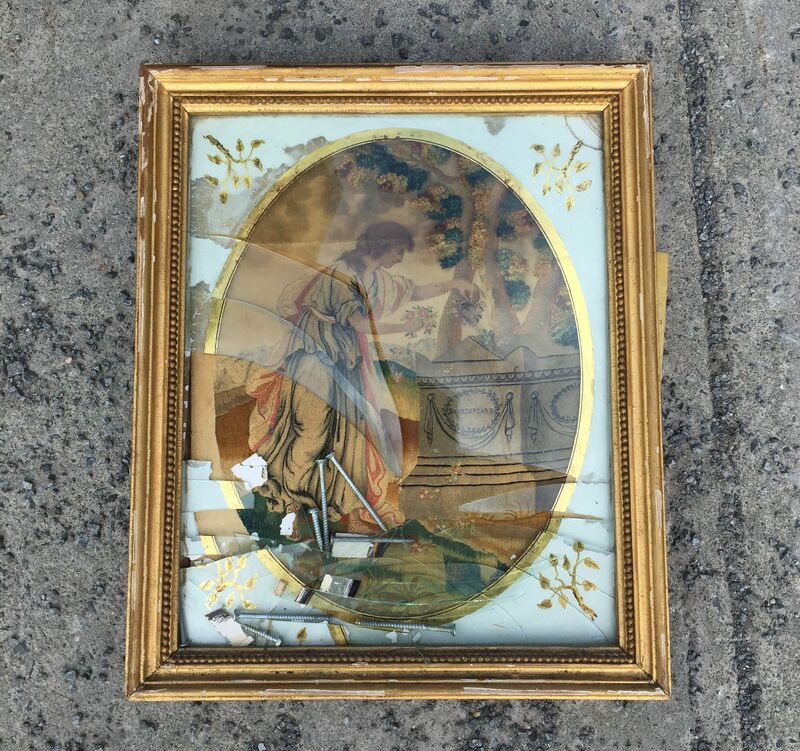 I found this busted frame in a bag the other day in Westmount. The picture was unusual, so I took it home for a closer look. Behind the broken glass was a cool embroidery on what felt like silk. 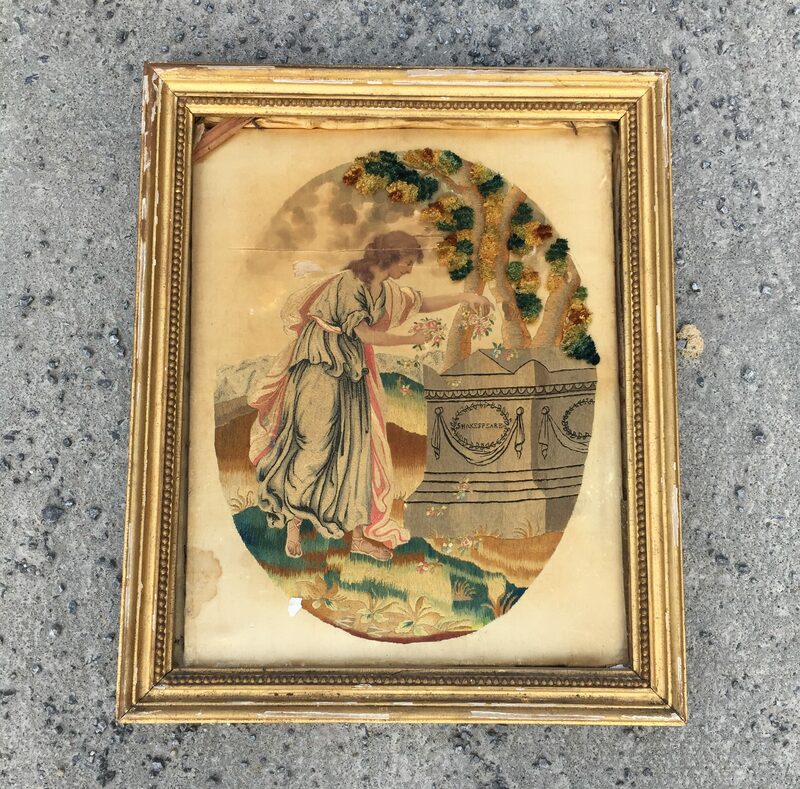 I’d never seen anything quite like it, but someone on Instagram identified it as a silk picture – a style that was popular in the late 1700s and early 1800s. This image, a woman laying flowers on Shakespeare’s tomb, was a particularly popular picture to reproduce back in those days – you can find a brief history of it here. Mine’s not in the best condition and probably isn’t worth much, but it’s always cool finding something that old! 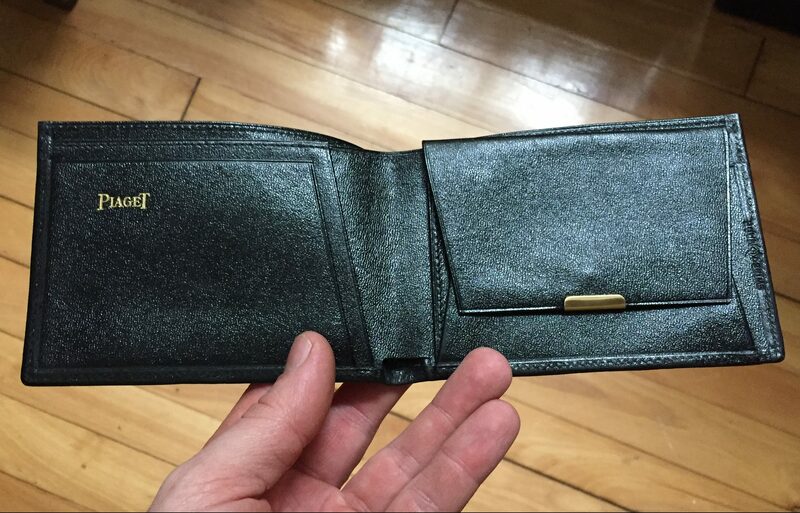 My old wallet fell apart recently. Fortunately, I found this one at just the right time (okay, maybe a few months later than would have been ideal). It looks to have been made for the Piaget watch company, so it’s a pretty classy looking wallet! A lot of other cool stuff has come out of this spot, but I’ll share those finds in a future post. The Mile End has been productive again lately. 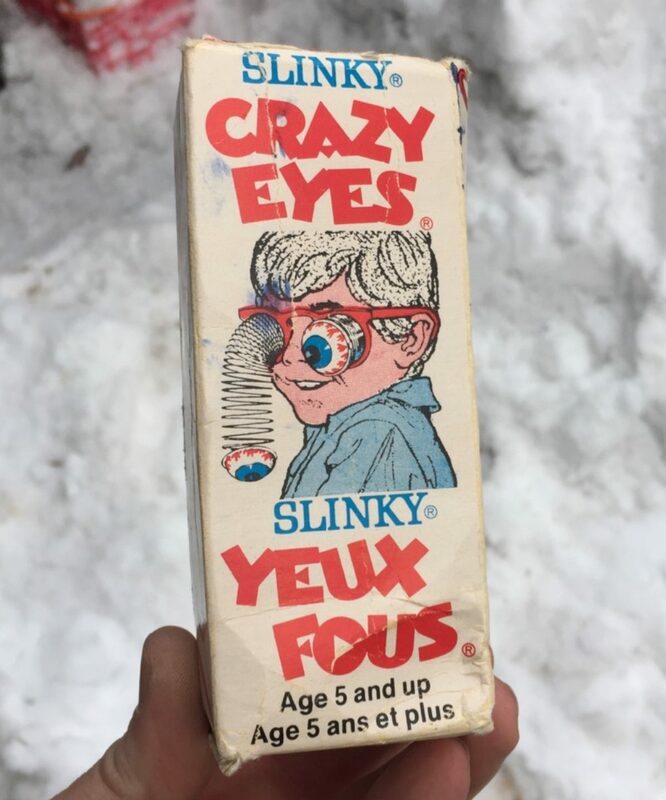 I found these Slinky Crazy Eyes in their original box a little while back. Here’s me (pre-haircut) putting them to use. Pretty fun! They’re worth about 20$, but I might just keep them. I found a bunch of jewelry while walking last week. 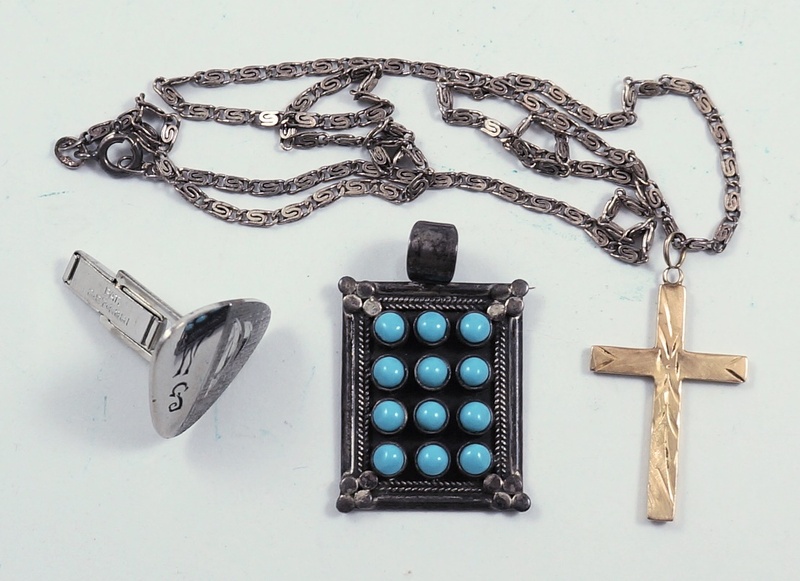 Most of it sucked, but I did save a gold cross on a silver chain, a single silver cufflink, and a cool silver & turquoise brooch. I’m guessing that this stuff was tossed because of a move, and I don’t expect to find anything there going forward. More impressive was this haul from just down the street a couple weeks back. 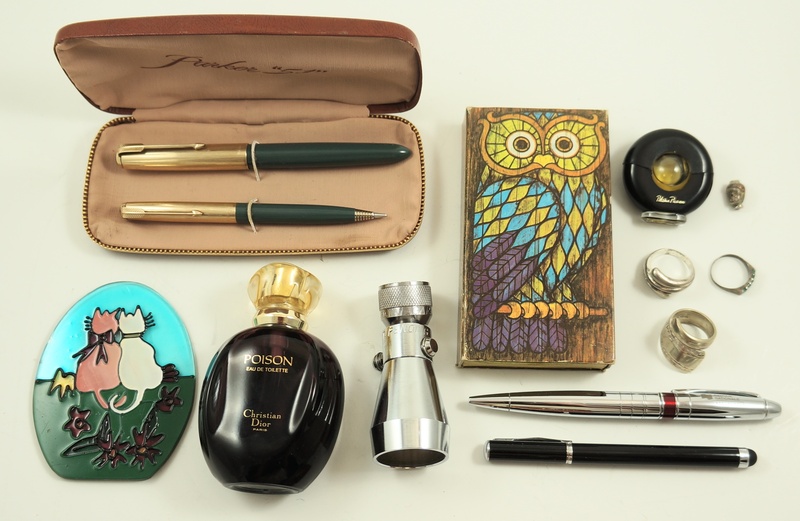 It included a couple of silver rings, a bit of perfume, and a great pair of Parker 51s. 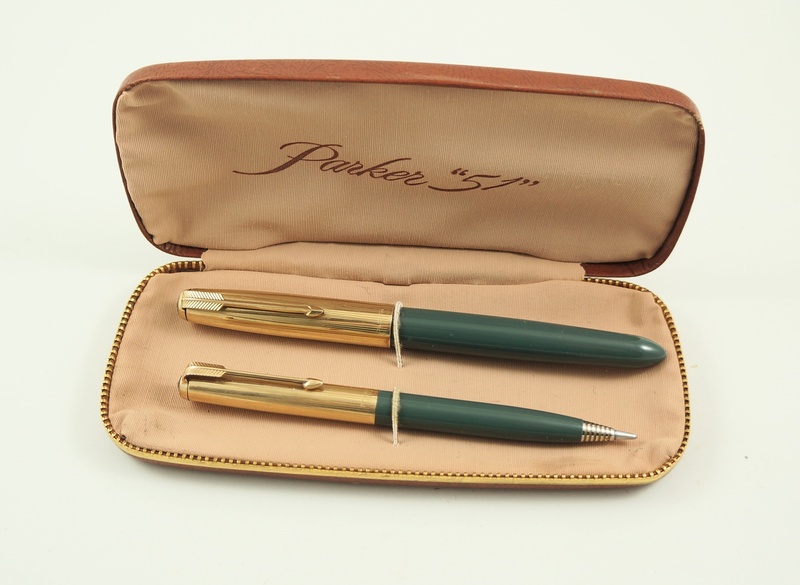 The set includes a fountain pen and a liquid lead pencil. 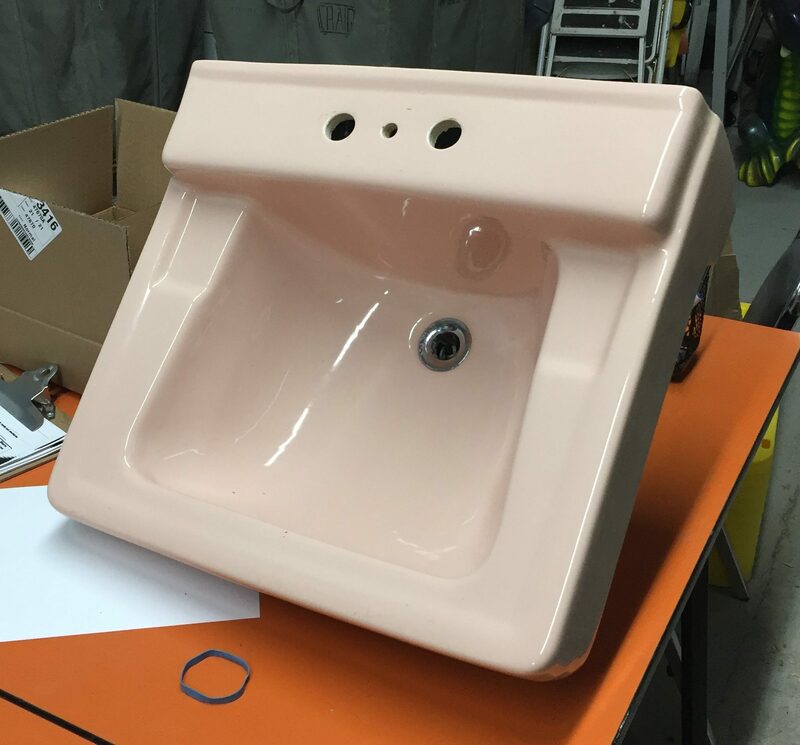 The presence of the liquid lead dates the pair to the late 50s / early 60s, that being the short time frame in which the “LL” was produced. It’s a beautiful set, and with the original case it should sell for at least 200$, perhaps more depending on the exact colour (which is kind of hard to tell). Nassau green for instance is an uncommon and collectible colour, but mine could also be “navy grey”… I’ll have to take a look at them in the sunlight before saying anything for sure. Regardless, that was a fun find! 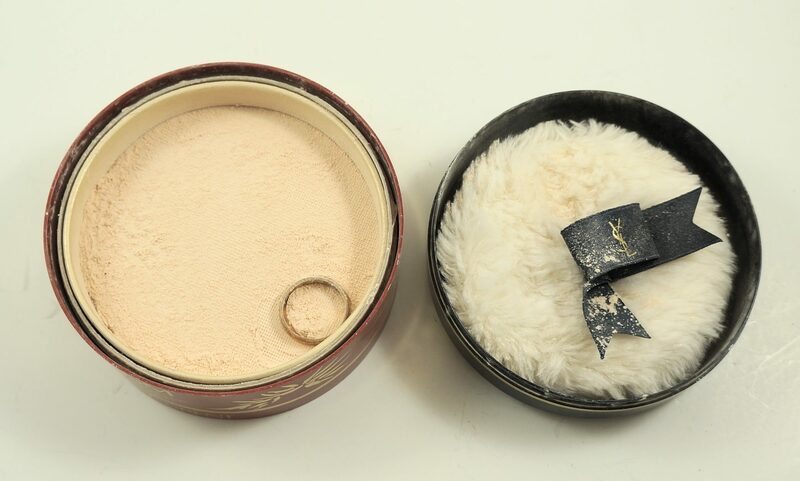 Also fun was this old Yves St Laurent dusting powder, which when opened revealed a 14k gold ring. That’s a first for me! I’ve been getting pretty lucky with gold lately, and I’ll share more examples of that soon enough. Otherwise I’ve been busy, maybe too busy doing organizational stuff. I recently spent some money and bought some industrial shelves, which should make it easier to keep the garage clean going forward. The weather has been mixed at best, but I expect that I’ll be able to do a yard sale in a week or two.